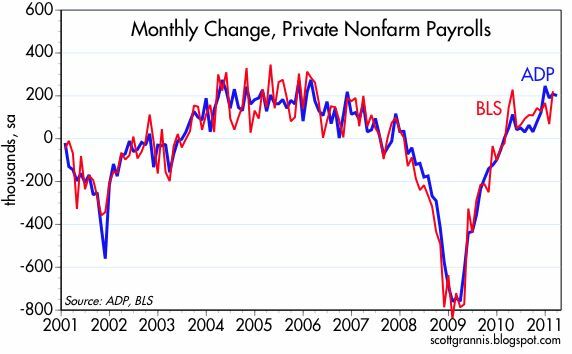 I haven't shown this chart for several months now, mainly because it wasn't telling us anything new—hiring activity had turned up a bit, but was nothing to write home about. In the past few months, however, there has been a very impressive pickup in the mining index. The mining sector (which includes mining, quarrying, and oil and gas extraction) is on fire, which further suggests that the broad-based strength in commodity prices reflects a good deal of genuinely strong demand. Speculation can be practiced by commodity producers just as easily as by commodity purchasers; a producer has merely to keep his stuff in the ground rather than dig it out and sell it. If producers were speculating on higher prices they wouldn't be so eager to hire people to get the stuff out of the ground. But if they see their orders running much stronger than expected even as prices rise, then they would be eager to ramp up production. It's been hard to quantify the contributions of easy money and supply/demand to commodity prices, and tempting to lay the lion's share of the blame on easy money and the weak dollar. This data suggests that the contribution of strong demand should not be underestimated. That in turn keeps the scales from tilting too much in the direction of inflation and instead more balanced between inflation and growth, and that's relatively good news. 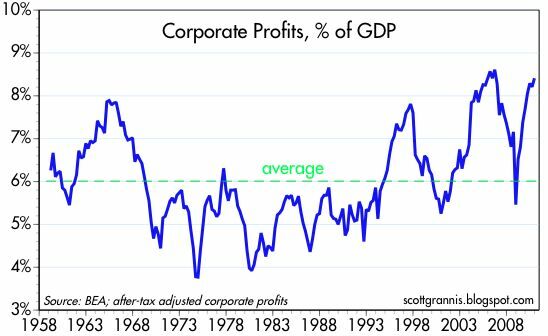 The disparity in highs and lows on this chart also illustrate one reason why it is taking so long for the economy to recover. It's not easy at all for workers to shift out of the flagging real estate and finance sectors into the mining sector. The economy has shifted gears in a rather radical fashion that doesn't lend itself to an equally radical shift in the resources of the labor force. 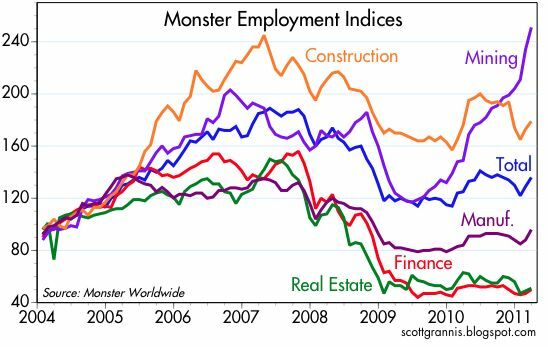 Mark Perry has some more detailed commentary on the Monster index here. 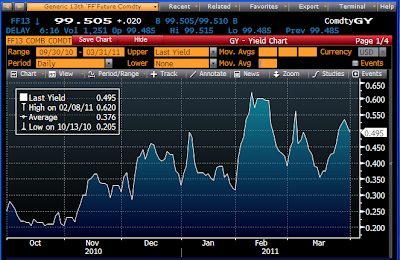 This chart shows the market's expectation of where the Fed funds rate will be in one year's time. The one-year forward funds rate is expected to be 50 bps, which equates to approximately one very modest "tightening" of monetary policy (the funds rate target is currently 25 bps). Thus, no matter what you may hear people saying about what the Fed is expected to do over the next year, the current market consensus is one tiny move up in short-term interest rates sometime around February or March of next year. Now, for things to actually turn out that way, I would argue that the economy is going to have to prove very sluggish, growing at no more than a 3.5% rate, and inflation is going to have to stop rising. Last year the economy grew 2.8%, and few forecasters are predicting a significant pickup (I think we could see 4%). Meanwhile, on a 3-mo. annualized basis, all measures of inflation have turned up meaningfully: the CPI is 5.6%, up from a low of -13.1%; the core CPI is 1.8%, up from a low of -0.2%; the PCE deflator is 4.0%, up from a low of -8.6%; and the core PCE deflator (the Fed's preferred measure) is 1.4%, up from a low of 0.2%. 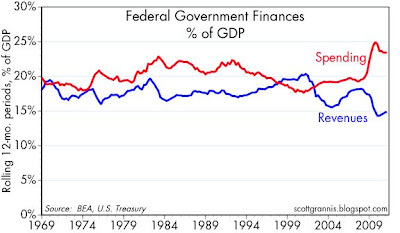 Fed governors are not exactly unanimous in their opinion of the need to continue with QE2. Some argue that QE2 should be suspended next month, while others feel comfortable running QE2 through June as previously announced. What happens will be largely driven by the numbers. If inflation continues to pick up, the hawks are going to become more numerous and vocal, even if the economy doesn't pick up. 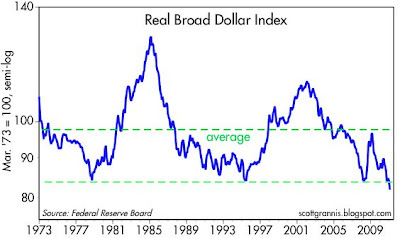 Given the weakness of the dollar (at or near all-time lows in both nominal and real terms against a broad basket of currencies) and the strength of commodities (with most trading at all-time highs and up sharply in the past two years), I will be very surprised if inflation does not continue to heat up. Finally, even if the Fed does raise rates sooner than is currently expected (something I expect), I doubt that this will be bad news for the equity markets. It would almost certainly be disruptive for the Treasury market, since rates out to 10 years are largely driven by the expected future path of the Fed funds rate. And it could cause corporate bond investors to get a case of the willies, though not a serious one, because spreads are still wide and it would take a whole lot of tightening to threaten the economy. 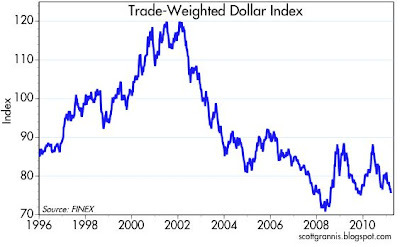 It would be very positive for the dollar, whose weakness reflects a debilitating loss of confidence on the part of investors worldwide, because a Fed tightening even in the face of a modestly growing economy would show that once again the Fed has its priorities correct. Without a strong dollar, economic growth potential can quickly be frittered away on speculation, inflation, and asset market bubbles. In short, an early tightening move would on balance be very good news in my opinion, and a welcome event indeed. The ADP payroll estimate once again suggests we will see a modest 200K gain in private payrolls this Friday. 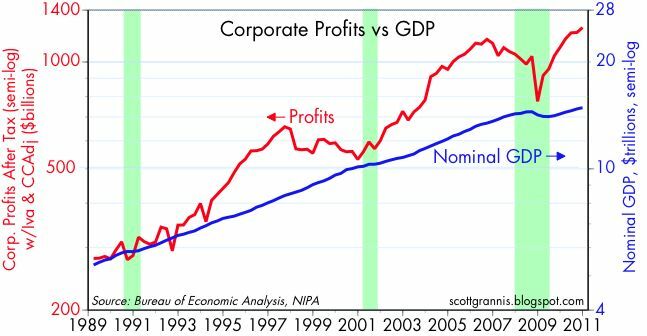 We need much more than that to get the economy back on a healthy growth track. The economy has done most of its adjusting, but a pickup in the pace of growth is likely tied to progress in Congress on cutting back our bloated Federal behemoth. Congress, the world is waiting for you to come to your senses and make convincing cuts in the size of our government. 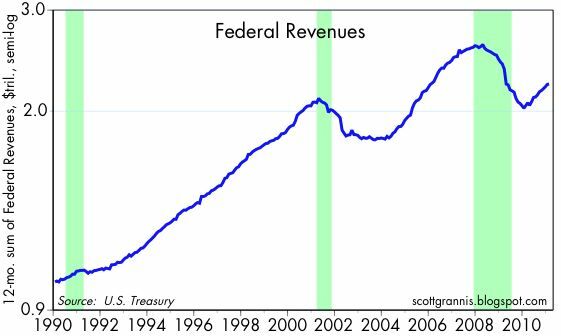 If we can trim spending and cut corporate taxes to boot (just one example of positive tax reform), then we could see the budget deficit close on two fronts, as spending growth slows and revenue growth picks up. We were out and about in Chaco province almost the whole day visiting extremely poor families that had improved their lives with loans from the Grameen-style bank that we helped get started some years ago. 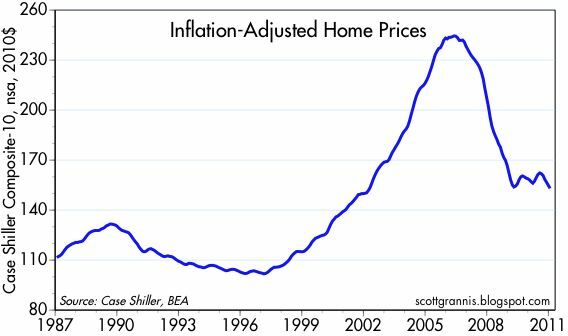 If any American could visit these same homes they would be on their knees giving thanks that they are living in such a rich country, where a 35% decline in the real value of homes (as in the chart above) is considered to be an unimaginable catastrophe. The value of most homes in the poorer parts of Chaco wouldn't even buy a used car in the U.S., and yet the people we visited and spoke to were serene and optimistic. Quite a lesson in humility and perspective. I wanted to post some photos from today but for some reason was unable to. I've got lots to say, but it will have to wait for later; we'll be back home in the USA this Friday. As for the U.S., we've obviously taken a big hit, but it's far from being the end of the world, despite the numerous calls today for a double-dip recession in the housing market. In contrast, I'm confident that home values will recover and life will go on. 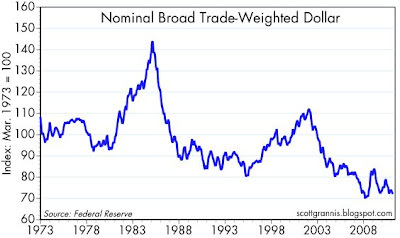 The Fed is doing everything in its power to avoid a deflationary meltdown of the US economy, and I think you underestimate the Fed's ability to get what it wants at your peril. Plus, there are many more signs of an economic recovery than of a looming double-dip. 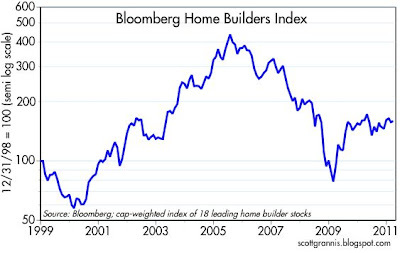 Moreover, consider the chart below, which shows the value of an index of major home builders' stocks. If the market is at all capable for looking into the future, then things are really not that bad at all. This is one of the most photogenic spots in the Torres del Paine park, and it was about 10 minutes from where we were staying. In the center right (top) portion you can see the Torres, and our camp/hotel was right at their base. I took the picture in the morning when no air was yet stirring, so the reflection in the river is quite amazing. Bear in mind that the elevation at this spot was only about 600 ft. It's amazing how much snow there is in the southern latitudes at relatively low elevations. 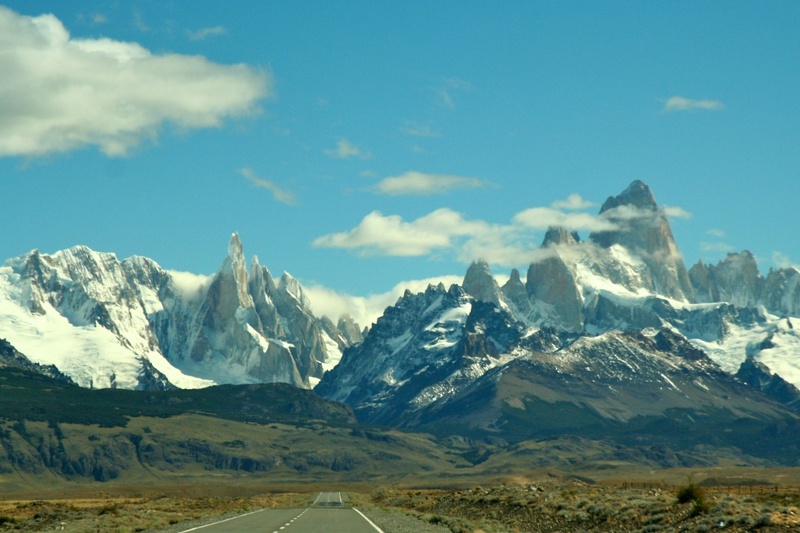 The huge Southern Patagonia ice sheet (third largest in the world after Antarctica and Greenland) is behind these mountains and stretches north for several hundred kilometers. Torres del Paine marks the spot where the Cordillera of the Andes drops down and even disappears for a bit, before resurfacing around Ushuaia, which is some 800 kilometers south of this spot. Tomorrow we have a long traverse to the provincia of Chaco, where we will be for the next several days before returning home. Blogging will be very light if nonexistent tomorrow, but I hope to keep things going whenever we have time at the hotel. We'll be spending most of our time visiting the Grameen-style micro-lending bank that we helped establish a few years ago. Chaco is the poorest part of Argentina, and we are told that our donation has made a real difference to lots of families there. More on this later. Fewer and fewer people are getting laid off these days, but the ranks of the unemployed remain large. 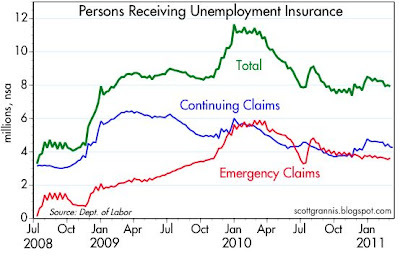 As the first chart shows, first-time filings for unemployment claims have fallen rather dramatically in the past two years, signaling that U.S. businesses have accomplished the lion's share of the needed adjustments to a slower economy and an eviscerated housing market. This is as it should be during tough times, but we've been waiting for the other shoe to drop, which is a pickup in new hirings. To date there has been some progress, but hardly enough (1% annual jobs growth) to put a dent in the ranks of the unemployed. 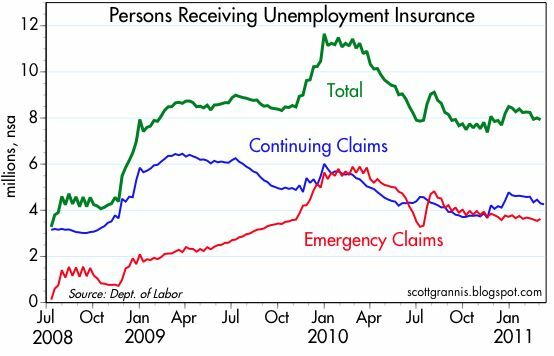 As the second chart shows, about 8 million people have been receiving unemployment insurance benefits since last summer. Companies are getting leaner and meaner, but what we really need to see is some meaningful expansion. That probably won't come until Congress takes substantive steps to curtail the runaway growth in government spending and entitlement programs. I think it's coming, but businesses understandably need some concrete evidence of federal belt-tightening before making new commitments to expand. Government needs to step out of the way before business is going to step forward. Capital goods orders declined in January and February, leaving orders about flat for the past six months. 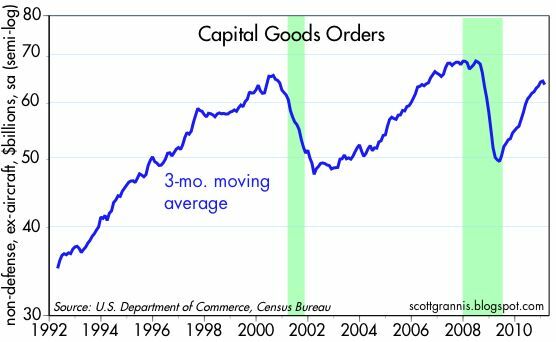 But the level of orders in February was still 10% above the level of a year ago. Whether the past two months represent a meaningful decline in business investment, a weather-related blip, or a pause after very strong growth in the second half of last year remains to be seen. 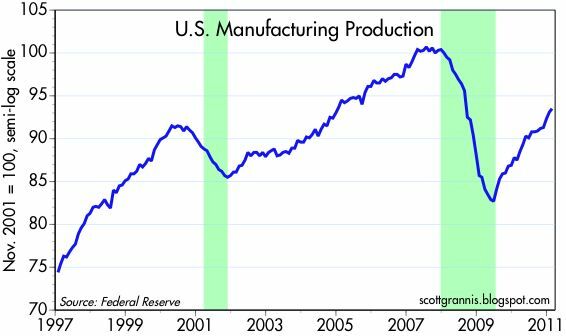 With other indicators (e.g., the ISM indices, regional Fed surveys, and manufacturing production measures) pointing to ongoing strength in the production side of the economy, I'm inclined to think this is a temporary slowdown, not unlike others that have occurred in the midst of business cycle expansions. As a public service, I post this chart which shows the average price of regular gasoline in the country, as compiled by the AAA. Gas is getting expensive once again, but I don't think it poses a serious threat to the economy. More likely, high energy prices will act to slow the economy's growth somewhat. 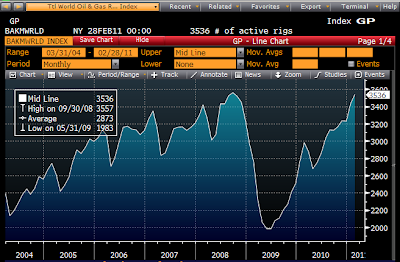 Meanwhile, the forces of supply and demand are coming to the rescue, albeit slowly and with a lag. As the next chart (Baker Hughes' total world oil and gas rig count) shows, higher oil prices are having the predictable effect of incentivizing increased oil and gas drilling activity. 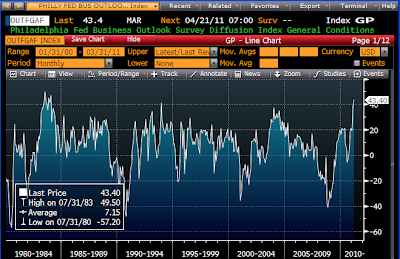 Higher prices will bring more supplies on line and reduce demand on the margin; that's the way markets work. 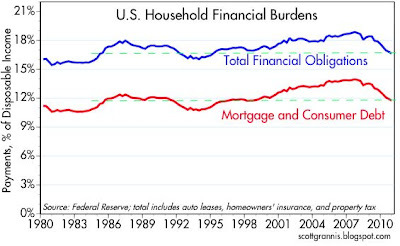 Recently released data for Q4/10 show that households' financial burdens continued to ease. Total financial obligations (auto leases, homeowners' insurance, property tax, mortgage and consumer debt), as a percent of disposable income, have fallen almost 12% from their Sep. '07 high. 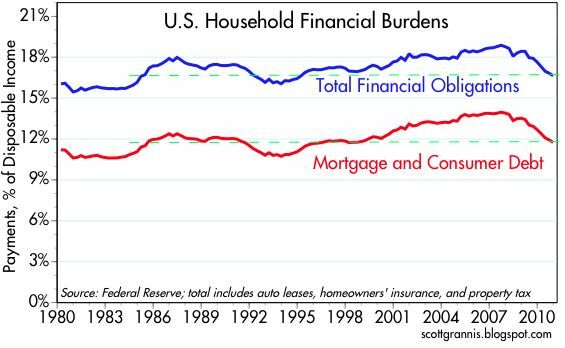 As the chart shows, debt and financial burdens have on balance been unchanged since 1985, after a rise in the mid-2000s. That equates to some meaningful deleveraging, and as I have pointed out before, this deleveraging occurred during a time of economic recovery. Debt is not essential for a recovery, and reducing debt is not contractionary. 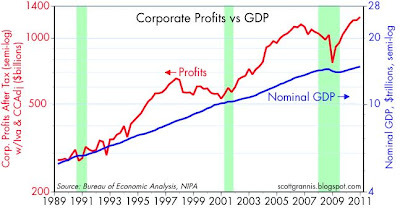 Debt facilitates economic activity, but it is not necessary for growth. You can't borrow your way to prosperity, but lending and financial market intermediation can make an economy more efficient. The problem with debt comes when consumers increase their borrowing in the belief that their financial and economic conditions will be unchanged or improved in the future, only to find out that the future did not turn out as expected. 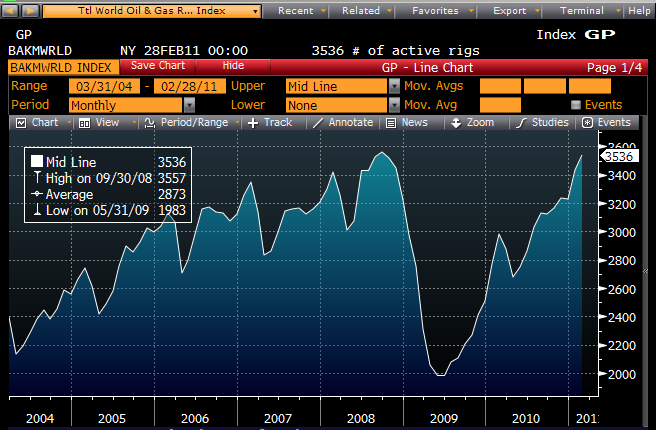 This is not a fatal problem, but it does throw a wrench into the economy's gears that can take some time to work out. In short, I think the reduction in financial burdens is a healthy sign that reflects the fact that people and businesses have been actively adjusting to changing circumstances, and it is this dynamic response to adversity that sets the stage for a new cycle of growth. 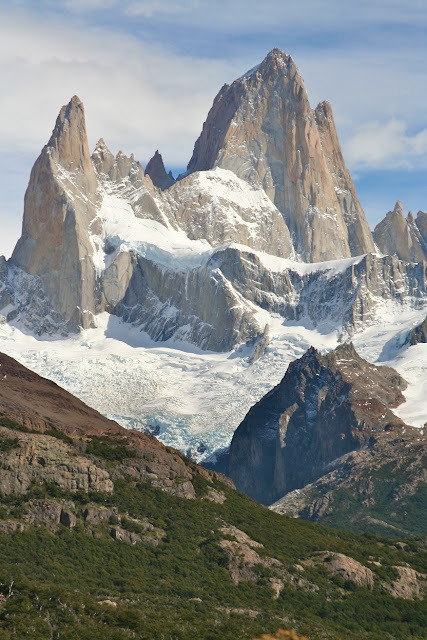 Here's another shot of what is arguably the most beautiful mountain in the world: Fitz Roy, in the southern Patagonia region of Argentina. After a few days in Buenos Aires and 8 days in the southern Patagonia region of Argentina and Chile, we are now in Tucumán, which is in the northwestern part of Argentina and my wife's home city. Last night we attended the wedding of a favorite niece of ours—a grand affair with some 300 guests, great food, and dancing. It was really impressive, but things here work differently than in the states. The church service was supposed to start at 9:15 pm, but there was another wedding taking place at that time that didn't finish until just before 10. But that didn't matter too much since the bride arrived at 9:55. The reception was scheduled for 10 pm, but didn't get underway until 11. After some drinks and hors d'oeuvres, we sat down to dinner at midnight. Dancing got underway at 2 am and was still going strong when we left at 5:30 am, at which time they began serving delicious little sandwiches for breakfast. This is all perfectly normal here and the sign of a successful event! 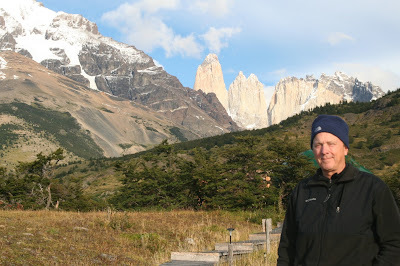 I wanted to take this opportunity to provide some details on the places we have stayed, and the person who helped us plan the Patagonian portion of the trip which proved so successful, as this may be of help to others wishing to experience this magnificent part of the world. To begin with, Francisco (Fran) Shaw, shown here in this photo with the mountains surrounding the Perito Moreno glacier rising above Lago Argentino, was instrumental in helping us plan this trip. 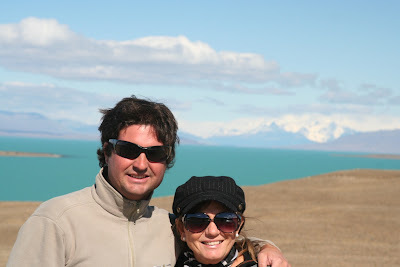 He is a Tucumano and a good friend of a good friend, and now lives in El Calafate, which is the gateway to Argentina's glacier district. He's in the tourist service business, like almost everyone in Calafate one way or another, and helps plan trips, suggest hotels, arrange transportation, and points you in the direction of the best activities and hikes. He can be reached at shawfrancisco@gmail.com. Be sure to tell him I sent you. He is also happy to make arrangements for tours in other parts of Argentina (e.g., Iguazu Falls (one of the great natural wonders of the world) and Bariloche). The biggest obstacle to travel in the Patagonia region is the enormous distances that must be covered between cities and the relative lack of population. That leaves you with only two choices for getting around once you have flown into a gateway city like El Calafate: a bus or private transportation. Private transportation takes long enough (e.g., 7 hours from El Chaltén to Torres del Paine), but the buses can take forever. Fran arranged private transportation for us which, though not cheap, was relatively pain-free. 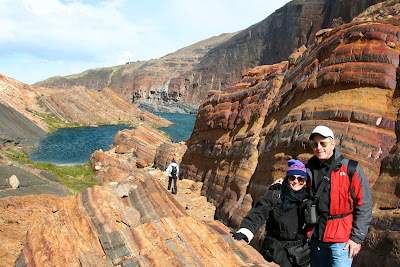 While in El Calafate we stayed at the Eolo Lodge, which was strongly recommended by Fran. It's located about midway between the town of El Calafate and the Perito Moreno glacier. It's somewhat isolated, but surrounded by beautiful scenery. The hotel is world-class and the food was five-star. It's the sort of place where everyone knows your name within 10 minutes of your arrival. 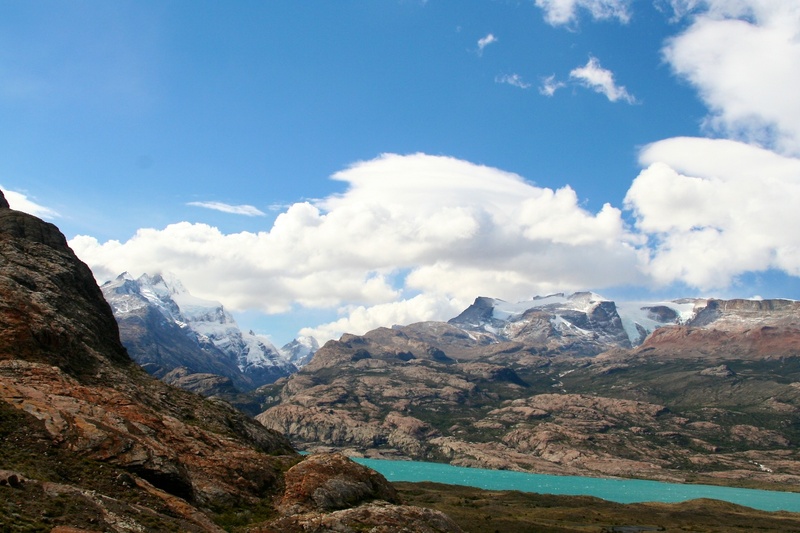 You might also consider Los Notros, which is right across the lake from the Perito Moreno glacier and has a great view, but it's very isolated and relatively small. There are a number of good hotels in town with much more reasonable prices than these two I mention. Everything works as it should and the place is perfectly suited for the international tourists that constitute the bulk of tourism in the area. (My wife was the only Argentine-born guest at the hotels we stayed at.) I would note that the town is a good 45 minutes to one hour by bus from any of the popular tourist destinations, but transportation is readily available. 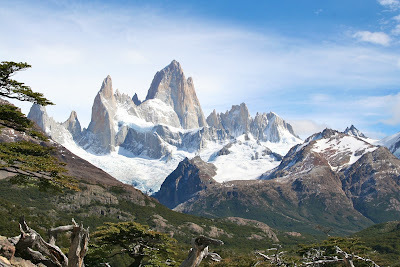 In El Chaltén we stayed at Los Cerros, the best place in town without question, and not very expensive compared to the alternatives. But there are dozens of smaller hotels and B&Bs, all of which are within easy walking distance of restaurants and the trailheads. 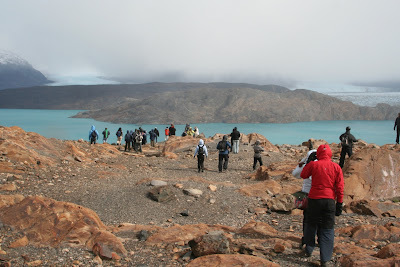 We were well advised to take the "easy" trail to the Mirador Torres on the afternoon of our arrival, and the somewhat longer but far more impressive trail to the Mirador Fitz Roy the following morning. 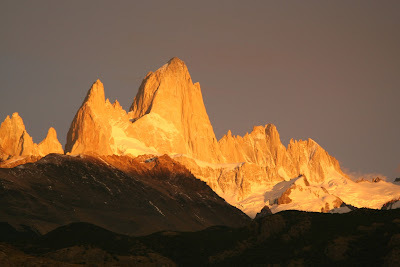 Do not miss Fitz Roy! 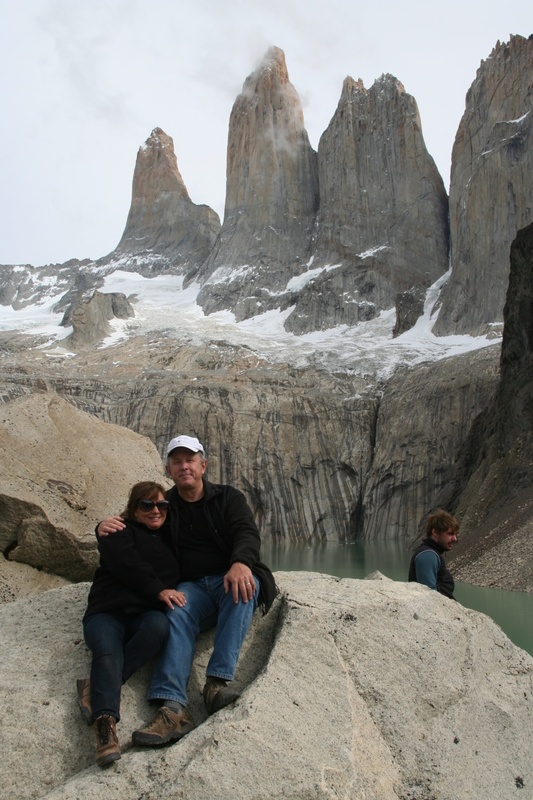 Our next and final stop was Torres del Paine National Park, which is just across the southern border of Argentina in Chile. You should plan on spending a minimum of two nights here, but preferably at least three, as we did. It's possible to tour most of the park in one very long day via car or bus, but if you want to really appreciate all it has to offer you should also spend at least a day on one of the many trails in the park. We took one of the more difficult trails to the Mirador Torres; it's 22 km roundtrip and about 2400 ft. of elevation gain, most of which occurs in two places—not for the faint of heart. The variety of magnificent scenery around the park (which is quite large, several times the size of Yosemite) is overwhelming. There is no regular telephone service in the park but a few of the hotels offer sporadic internet connections that didn't work while we were there. There are only a half dozen or so hotels in the park, and most are booked for months in advance during the summer season, which starts in November and ends by mid-April. There are numerous campsites however, for the many backpackers that flock to the park. Outside of November-April, you'll find that it is extremely cold and most places simply shut down for the long winter. Ditto for El Calafate and El Chaltén. Partly because we had no other choice, and partly because of Fran's recommendation, we stayed at Eco Camp, which is considered a "refuge" rather than a hotel. It's an eco-friendly place that gets all its electrical power from a hydroelectric turbine that is fed by water from the mountains above the camp; the turbine is a bit bigger than a garbage disposal. It's a cross between a hotel and a communal camp. Each couple has a separate green geodesic dome (get one with a private bath if you can), and there are three large domes for the store, bar, and eating area. It greatly exceeded our expectations and we had the opportunity to meet quite a few people from all over the world. The price includes all meals and tours/activities. It is situated in a great spot with views of the Torres. Our dome is right behind my head. If you wanted to create the most efficient travel itinerary, it would probably go like this: fly into Puerto Natales from Santiago, or take a boat from Puerto Montt; transfer by bus or car to Torres del Paine; transfer from there by bus or car to El Calafate; transfer by bus or car to El Chalten; return to El Calafate; fly from El Calafate to Buenos Aires. But no matter how you cut it, you will be spending many hours going by land from one place to another. Let someone like Fran help you figure out what works best for what you want to accomplish. The point of this chart is to put into proper perspective the Fed's efforts to inject dollar liquidity into the global economy. It uses a semi-log scale because the change in the amount of bank reserves has been extremely large in the past two years or so. 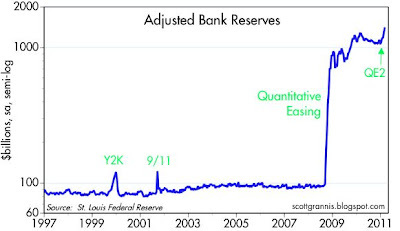 The first stage of Quantitative Easing saw bank reserves soar from about $100 billion to almost $1.3 trillion, and the Fed accomplished this by purchasing MBS and Treasury securities by the bushel, in addition to extending credit to the financial system through swaps, repos and special loans. As the latter injections began unwind, bank reserves shrunk from a high of $1.28 billion in Feb. '10, to $1.07 trillion in Oct. '10. Concerned that they might inadvertently be allowing a tightening of monetary policy at a time when deflation concerns were (allegedly) meaningful and the economy was (allegedly) still struggling, the Fed launched QE2 in Nov. '10. Those purchases have now pushed reserves up to a new high of $1.42 trillion. Since Oct. '10, bank reserves have increased by $350 billion as a direct result of the Fed's purchases of Treasury securities. 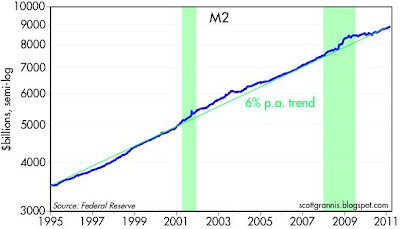 But since there has been no unusual growth in the other components of the money supply (e.g., currency and M2), and no huge increase in required reserves (reserves that need to be held against bank deposits) we can conclude that almost all of the increase in bank reserves has served merely to satisfy the economy's and the financial system's demand for bank reserves. And as I've explained before, since bank reserves are essentially obligations of the U.S. government and pay an interest rate similar to that of T-bills, which are considered to be the safest way to hold money in the world, the world was apparently eager to increase its holdings of safe money by $350 billion in recent months, and the Fed was happy to oblige. If the world (and the banks) had been unwilling to accumulate additional stores of safe money that yields almost nothing, then we would have seen a significant increase in required reserves, a corresponding decrease in excess reserves, and a big increase in the growth of money (currency and M2). Instead of holding excess reserves in growing quantities, banks would have been putting those reserves to work by using them to generate new loans, increased deposits, and more currency. Loans would have generated a yield significantly higher than the yield on bank reserves—a virtual money-making machine. But this is not happening, because banks are satisfied with holding onto more safe, low-yielding cash, and the world in aggregate is apparently unwilling to increase its leverage. 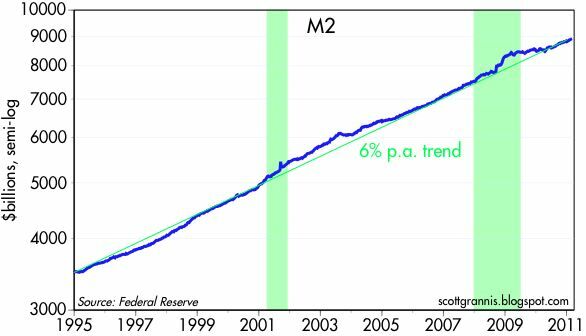 M2 is growing at close to a 6% annualized rate, and this is the rate of growth that has prevailed for the past 15 years on average, as the next chart shows. Currency in circulation is up about 7% in the past year, and has only risen at a 5.4% annualized rate in the past two years; again, no sign of any unusual expansion. In short, the Fed has dumped a ton of reserves into the banking system, but banks have been either unwilling to make new loans, or the economy has no desire to take on more debt, or both. 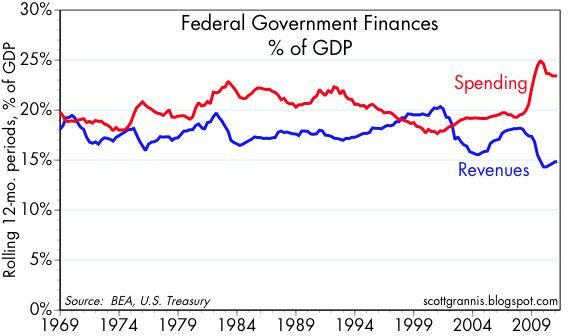 There is still a great deal of uncertainty out there that would explain why reserves have been hoarded instead of utilized: e.g., huge fiscal deficits that raise the specter of huge increases in future tax and regulator burdens, and of course the Fed's own potentially inflationary monetary policy. The result of all this is that to date the Fed's actions have not been overtly inflationary (i.e., there is no sign that the amount of money in the economy has increased by enough to provoke a significant rise in inflation). 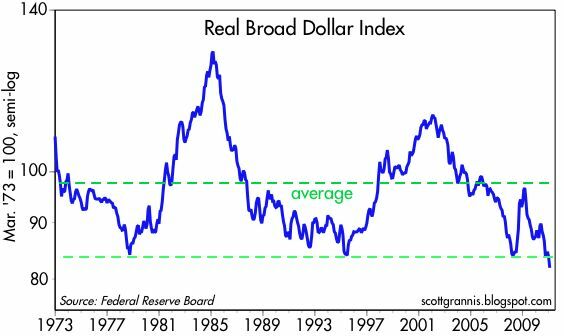 However, there are several sensitive and leading indicators that suggest the Fed is in fact making an inflationary mistake: e.g., rising gold and commodity prices, the very weak dollar, and the very steep yield curve. At the same time, there have been numerous signs in the data in the past few months that strongly suggest the economy is picking up speed: e.g., the ISM surveys, rising commodity prices, manufacturing production, car sales, and the decline in unemployment claims. In addition, measures of confidence are starting to perk up, and C&I Loans are picking up, which further suggests that the economy's demand for money is beginning to decline (which would allow 6% money growth to fuel much higher growth in nominal GDP). The biggest positive on the horizon is the likelihood that Congress will finally begin to tackle our out-of-control fiscal policy trainwreck-in-the-making without raising taxes. I think there is enough smoke out there to be worried about an inflationary fire, but I don't yet see a reason to call for a calamity in the making, as some are (e.g., a dollar collapse, hyperinflation, and another recession/depression). I do think that the risk of deflation is now virtually nil, and that therefore Treasury yields are exceptionally low and at risk of rising significantly. Measures of credit risk are still priced to higher-than-normal default risk, which is unlikely to prevail if money is indeed easy and the price level is set to rise meaningfully. 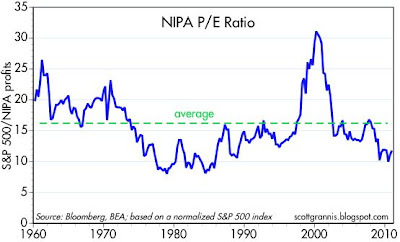 Equity markets are priced with a good deal of fear built in (the Vix is still substantially above its long-term average), PE ratios are about average despite NIPA earnings being at record highs, and earnings yields are higher than corporate bond yields. So I think it still pays to be bullish on the economy, the equity markets, and corporate bonds, but bearish on Treasuries and cash. The good news about the Federal budget data recently released for February is that the deficit continues to shrink (albeit modestly) relative to the size of the economy, and the growth of revenues—which has been about 10% per year for the past year or so—continues to outpace the growth of spending, which is rising about half as fast. This is as it should be in the early years of a recovery. 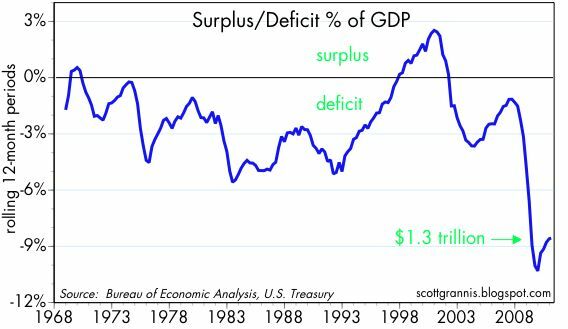 The bad news is that the deficit is still huge, at $1.3 trillion in the past 12 months, and represents about 9% of GDP. That's big and bad by any standard. Keynesians have preached for years that big deficits like this are stimulative, but we have now proven beyond a shadow of a doubt that big deficits that are driven by lots of spending and transfer payments act only to slow the economy's growth. That's because they consume a significant portion of the economy's resources in a very inefficient manner. In short, they reduce the economy's overall productivity, and that results in a slowdown in the rise of living standards. Last night we went to a dinner and tango show at Esquina Carlos Gardel in Buenos Aires. I've seen lots of tango—and even learned it some years ago—and this is fourth tango show I have seen in Buenos Aires. This one was clearly the best. Best, because it is faithful to the real tango, the dancers are marvelous, and the music (according to my wife) was thrilling. If you like the sort of dancing on "Dancing with the Stars," then don't see this show, because it goes to the heart of what tango really is, rather than dramatic and unrealistic choreography. Tango is an art form, and the most sensual of all dances by far. On top of that, the theater is beautiful, the show is really well done, and it's located in the Abasto district where Gardel first turned tango into a global sensation. The show was preceded by a fascinating movie—with subtitles—that covers the history of tango. Moreover, the food was delicious; I had a huge bife de chorizo that must have weighed over a pound, and it was cooked to perfection (which, for Argentines, is appropriately called "a punto"). Food, wine, show, and transportation from your hotel to the theater and back was only $125 per person ($500 pesos). Argentina isn't as cheap as it has been in the past, but by the standards of other major cities this was a bargain. 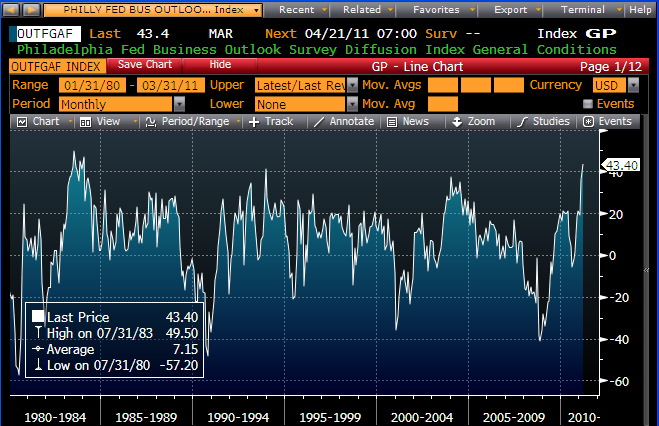 The Philadelphia Fed Business Outlook Survey came in very strong. 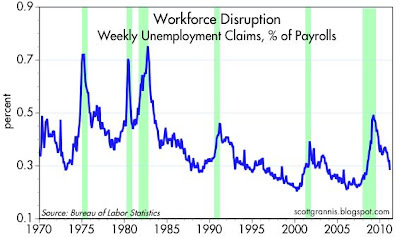 It hasn't been this strong since the economic boom times of the early 1980s. Very difficult to ignore the mounting evidence of a strong economic recovery. This is not going to be easily derailed. 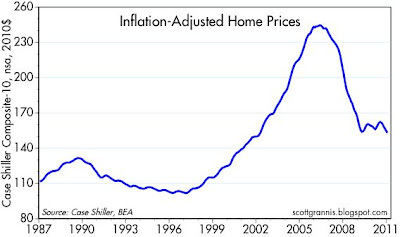 Plus, the survey noted widespread evidence of rising prices. Things are picking up all over the place. 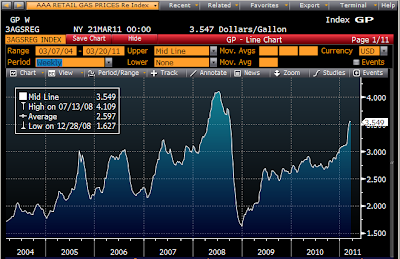 How much longer is the Fed going to be able to ignore this? 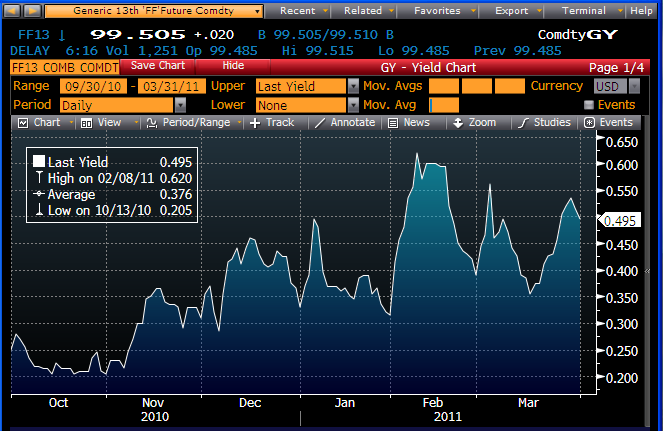 There is absolutely no need for short-term interest rates to be zero. 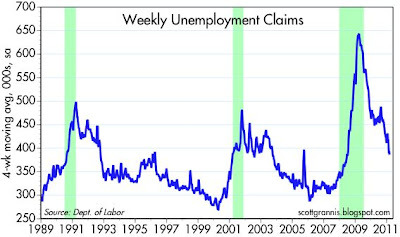 Weekly claims for unemployment continue to decline, and at a fairly impressive pace. 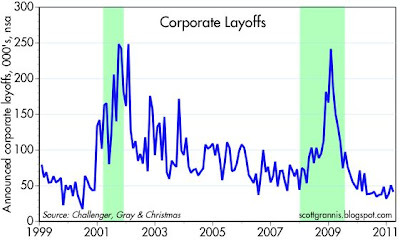 It is difficult to imagine that the decline in layoffs will not be followed by a pickup in the pace of new hirings, considering that just about every measure of economic activity reflects decent and continuing growth. I found this explanation by Josef Oehmen to be very thoughtful and helpful. If he is right, the world's concerns are highly inflated. More good information can be found at MIT's site. I was isolated in the southern Patagonia since last Tuesday, so I can truthfully say I have not been caught up in what appears to be a global "panic attack" over the Japanese radioactivity problem. I have some time today so I am beginning to catch up on the recent statistics that I've missed. 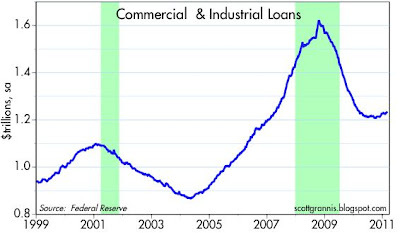 This chart further confirms the pickup in C&I Loans (bank lending to small and intermediate-sized businesses) that I have been highlighting the past month. Loans are up at a 7.8% annualized rate over the past 3 months. That's significant. Deleveraging now appears to be a thing of the past, in aggregate. Confidence is returning, and this bodes well for the future. 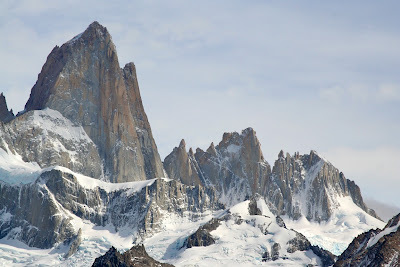 You usually only see this photo of Fitz Roy on posters. But we had the incredible luck of seeing it on our departure from El Chaltén. We were picked up at the Los Cerros Hotel at 7:30, right around dawn, and as we left the town, headed east, we looked back to see this. Because the sky on the horizon was relatively clear, the rising sun had illuminated the top part of the Andes (the town is in the darkness at the lower right of the photos), but not yet the bottom part. 5 minutes later, as we continued eastward, the sun had risen further and was covered up by some clouds and this view was gone—all was in darkness. It was simply breathtaking. Of all the wondrous sights we saw in the southern Patagonia, Fitz Roy was my favorite. Not to be missed! After a 7 1/2 hour drive from El Chaltén to Torres del Paine National Park in Chile, we found ourselves surrounded by more spectacular scenery. (More on the details of our trip and where we stayed later.) Next morning we took a bus tour of the park, and took this picture at one of the stops. 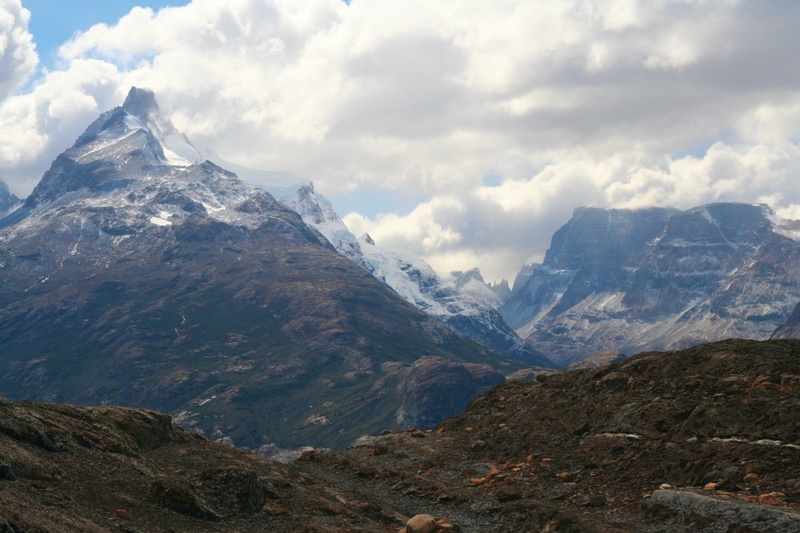 The V-shaped formation at the upper right of the photo is called "Los Cuernos" (the horns). Note the color of the lake (a milky blue which results from glaciar-caused sediments). These are the famous "Torres," or towers, that we had first seen from our hotel in El Calafate, from a distance of about 35 miles. We could also see them from the window of our room at EcoCamp—one of the few "refugios" in the Torres del Paine park (i.e., not a typical hotel, more like a glorified camp). Problem is that it takes about 7 hours by car to get from that hotel in Calafate to the Torres del Paine park, because you are forced to follow a huge loop that extends to the east and south, then suffer the bureaucratic hassles of Argentine/Chilean customs, and then endure over two hours of a dirt road that includes a bridge so narrow that our driver had to remove his side-view mirrors before crossing. Behind the rock we are sitting on is a mini-glacial lake. The valley we are in is surrounded by towering peaks, and I think it is called Valle de Silencio, since it is completely protected from the winds. The Towers are a mecca for serious mountain climbers (which we are not). My overall impression of the southern Patagonia is that it offers breathtaking views, spectacular scenery, unmatched beauty, and an endless variety of natural wonders and diversions. Unfortunately, it is difficult to get to, it is very time-consuming to get around, and it is not cheap; all prices are set by what an international tourist crowd can afford to pay (we saw very very few local tourists—most were from the US, Canada, Australia, England, Japan, and Western Europe). 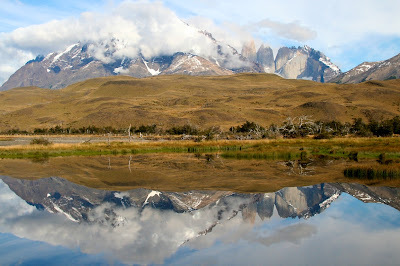 The closest airport to Torres del Paine is Puerto Natales, but that is 2 1/2 hours from the park on a mostly-dirt road. English is the lingua franca; I think I saw more signs in English than in Spanish. The people are extremely friendly, the food is good-to-great, and the opportunities for exercise are unlimited. And in the end, we saw so many world-class views that we almost lost our capacity for wonderment. 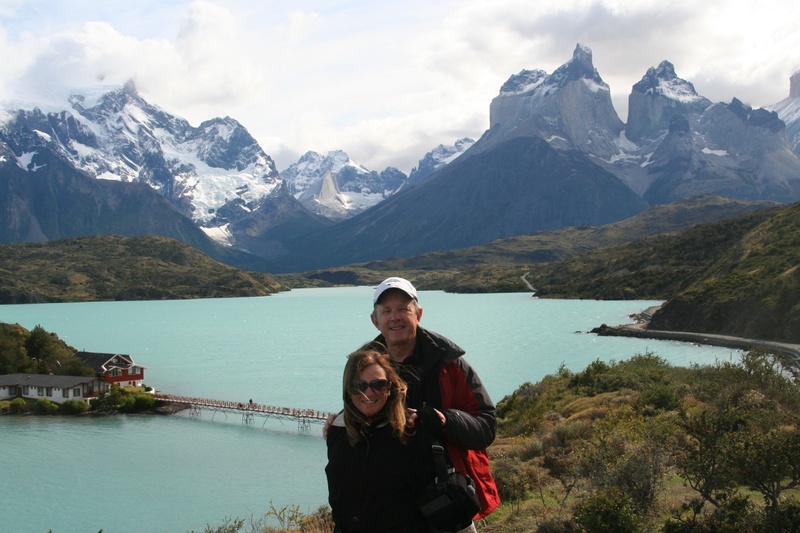 We've been in Torres del Paine the last several days and are now back to civilization—in the sense that we once again have an internet connection. I'll post some more great photos of El Chalten and Torres del Paine when I have some more time. Right now we're in El Calafate waiting to board a flight to Buenos Aires. It was a very overcast day this morning as we set out by boat to go to the northern end of Lago Argentino. 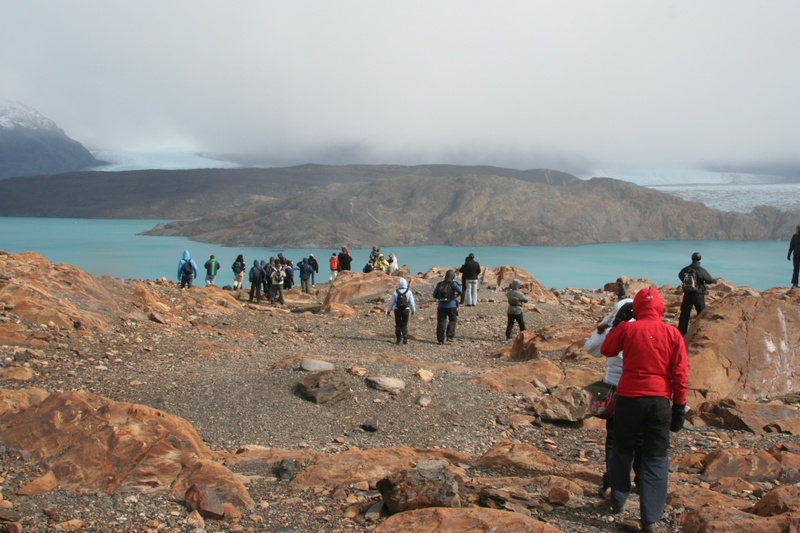 After two hours we arrived at an area just south of the Upsala Glacier, which is about three times the size of the Perito Moreno Glacier! Problem is, the icebergs that calve from this glacier are so huge and so numerous that you can't get very close to the glacier itself. So the boat spent about 20 minutes cruising back and forth among the gigantic and gorgeous blocks of ice, and we were treated to a display of size, luminosity, and vivid blues. This next shot is a closeup of a branch of the Upsala Glacier which empties into a lake (which is on the right side of the previous photo). Note that in the upper portion of this photo the glacier extends back literally as far as the eye can see—some 20 or 30 miles. The size of this sea of ice was simply breathtaking. I had no idea you could find a vantage point so far above such a massive ice field. In the far distance is Chile's portion of the ice fields. If I remember correctly, the Patagonian ice/glacier fields rank #3 in the world for size, after Antarctica and Greenland. Glaciers and mountains and peaks and lakes everywhere. After marveling at the size and scope of these glaciers, we headed east and were greeted by what at first sight struck me as a miniature Matterhorn. As you can see from the picture, we were very close to the same altitude as these impressive and fearsome peaks, which must be 6-8,000 feet high (I think). We then turned back south and started down, and shortly entered the Valle de los Fosiles (Valley of the Fossils). From jutting alpine peaks to rounded brown rock formations in a matter of minutes! Apparently this part of the Andes is a mish-mash of all sorts of things. I have spent a lot of time hiking in the Sierra Nevadas of California and skiing in Colorado, but I have never seen such a variety of shapes, colors, and rock formations in so small an area. The jumble of colors in this photo was something you would expect to see in Disneyland. Squashed between massive granite formations, we found shale rock with an abundance of primitive fossil creatures, and small alpine lakes filled with brilliant blue waters that contrasted to the milky-white waters of the glacier lakes. After an hour or so of descent, we came back to the long valley that constitutes the majority of the land administered by the Estancia Cristina. By that time the weather had cleared up and we were treated to a magnificent view of blue sky, peaks, glacier lakes, and canyon walls that are only rivaled by those of Yosemite (in my experience). All of the above in the span of just 9 hours. Unbelievable. Today was spent getting to know the Perito Moreno glacier in Argentina's Glacier National Park (accessed via El Calafate in the southern part of Argentina). It was really quite an experience! Correct me if I'm wrong, but I believe this is the only glacier in the world that you can climb on and view from almost 360º. It's not the biggest in the world, but it's massive and gorgeous, and there's nothing like getting up close to it from all sides. We started by taking a boat across the lake so that we could go glacier-climbing on the left edge of the glacier in this photo. We weren't very lucky with the weather, since it was mostly overcast and we were rained on for about the first hour. Nevertheless, it was thrilling. 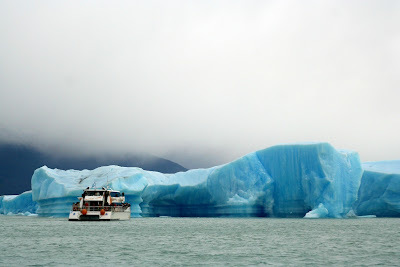 This is the view of the glacier as we were passing by in the boat. It must be several hundred feet high and is more than a mile wide. Note the deep blue colors in the fissures. The glacier advances about a foot a day or more, so it is continually calving into the water. They say it takes the ice about 500 years to wind its way down the mountain (the glacier's origins are 25 miles or from this point). 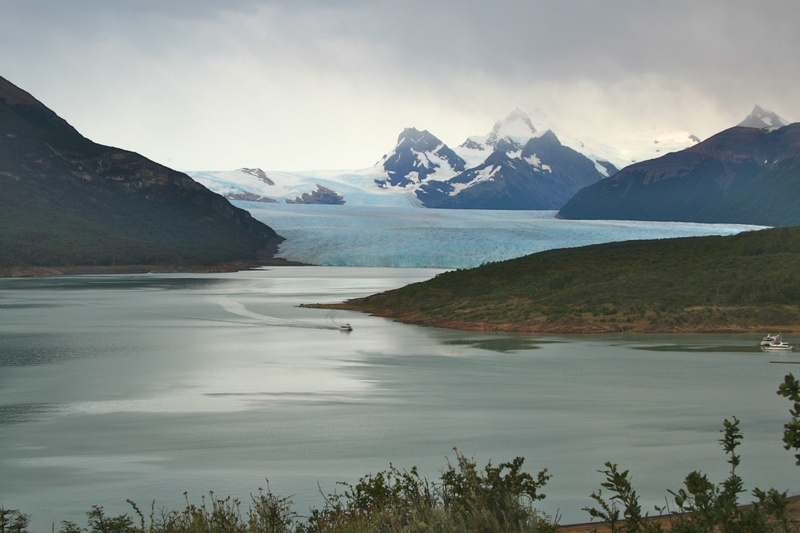 Note the color of the water (a muddy white, typical of glacier lakes), which is part of Lago Argentino, Argentina's largest lake. It it only about 800-900 feet above sea level. Walking up the glacier was a kick. We made it almost to the top of the glacier and spent a few hours wandering around and peering into chasms and fissures. At the end of the tour, our guides served us some Argentine scotch using ice and water taken directly from the glacier. 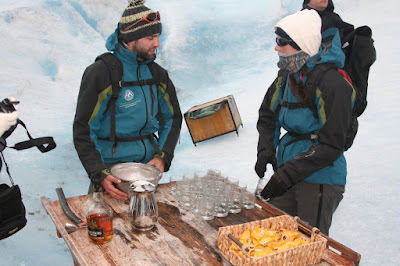 8-year old scotch on 500-yr old ice! Later we went back to the other side of the lake and walked along some incredible walkways that the government recently finished. 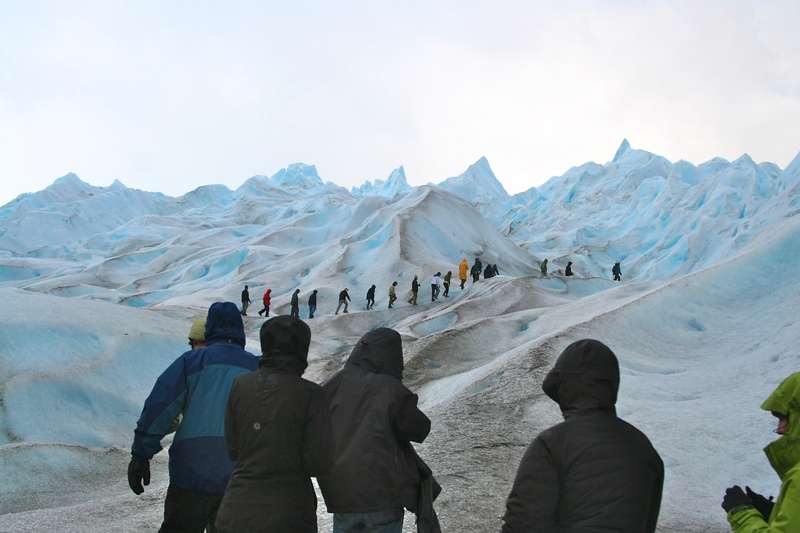 They stretch for well over a mile and allow you to get some magnificent views of the glacier from head-on and from all sorts of angles. 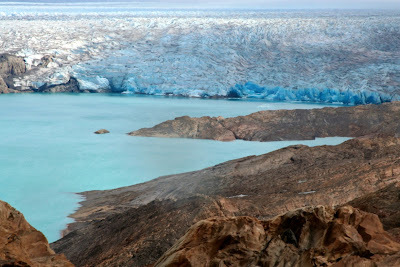 The dark spot on the glacier in this photo is at the point where, when the glacier advances enough, it reaches the other side of the lake and forms a dam. That can raise the level of one part of the lake by as much as 60 feet, but then the water pressure starts undermining the dam and the whole thing collapses in a gigantic rush of water and tons of falling ice. That happens at random (multi-year) intervals and to see it is supposedly breathtaking. There is a video of the dam rupturing here (not sure it's the best, but it can get you started if you're interested). 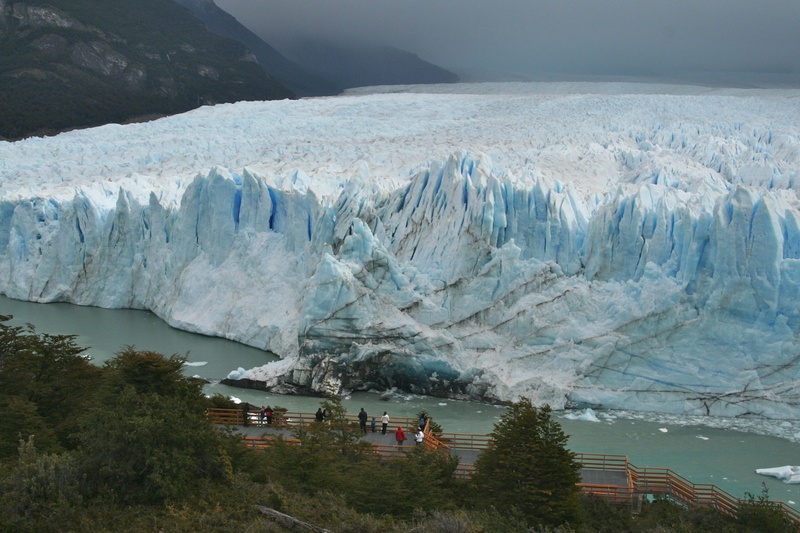 If you are ever going to go to great lengths to see a glacier, this is the one. 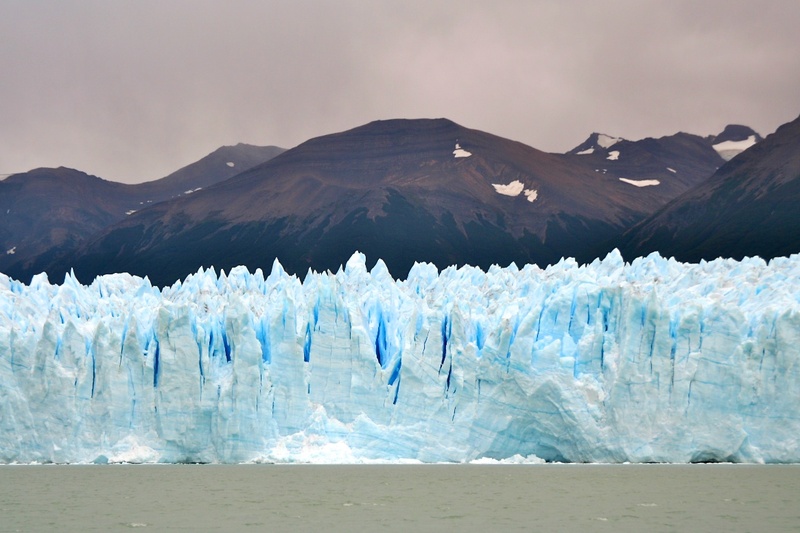 Argentina has two attractions that we've seen that rate as world-class natural wonders in my book: Iguazu Falls (in the north, on the border of Argentina and Brazil), and Perito Moreno glacier. Both should rank high on your bucket list, and both are very well run and organized for the international tourist. I only wish the Argentine government could do everything this well. Time to get dressed for dinner, which is going to be barbecued Patagonian lamb!